Alberta-based Griffiths Energy International Inc. has been charged with violating the Corruption of Foreign Public Officials Act. In November 2011, the company’s new management discovered that the former management had entered into consulting contracts with two entities owned and controlled by a foreign public official and his spouse. The company investigated and then self-reported and cooperated with the RCMP and the US Department of Justice. Griffiths believes that it is the first company to self-report for foreign corruption. 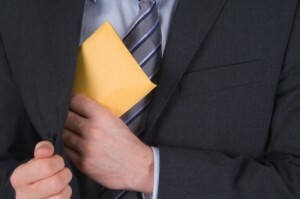 Canada’s Corruption of Foreign Public Officials Act makes it a crime to bribe, or offer to bribe, foreign officials. So far, two companies, Hydro Kleen and Nikko Resources, have been convicted and paid fines for bribing foreign officials. As well, in early 2012, tech executive Nazir Karigar was indicted on charges of bribing an Indian cabinet minister. Griffiths is an international oil exploration and development company with contracts to explore and develop oil reserves in southern Chad.